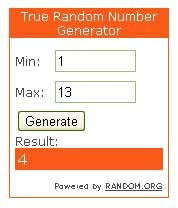 First let me announce the winner of the Eclos Beauty Starter pack. Deanna has already responded to my email so this is a done deal. Thank you to all who participated! I promise to make my next giveaway go more smoothly. Remember a few weeks ago I told you guys I was running low on cake pictures? I still have a few, but I am saving them for the future. I hope you like this post. 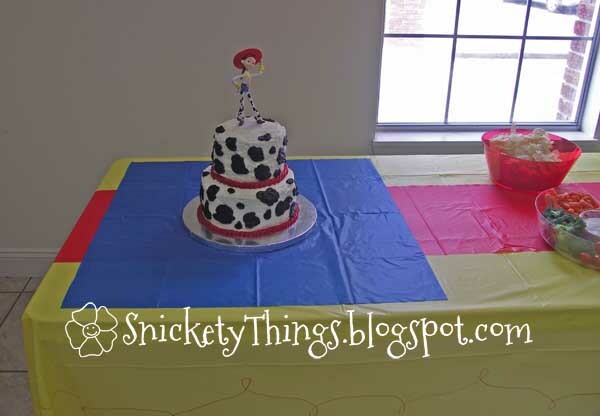 Do you guys recall the Toy Story Jessie cake I made last year for my daughter's sixth birthday? 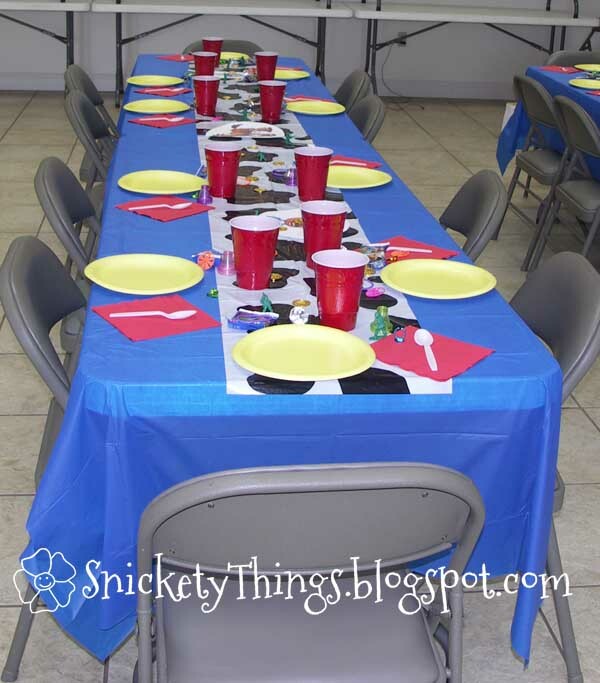 Today I am going to tell you how I set the tables up for the party. I pulled the color scheme from Jessie herself. I chose red, yellow, blue and cow print (yes, I know cow print isn't a color but just hang with me on this). I just grabbed some of those thin plastic tablecloths from a local party store and went to work. Here is the table that greeted the guests as they arrived. I cut a reverse scallop on the edge of the table cloth to mimic Jessie's shirt design, then used a red sharpie to mark the thread feature. You know, that little loopy design her shirt has. I used a strip of the red tablecloth down the center. This was where the kids got their name tag badge to wear. I set the table up for food in a similar manner. 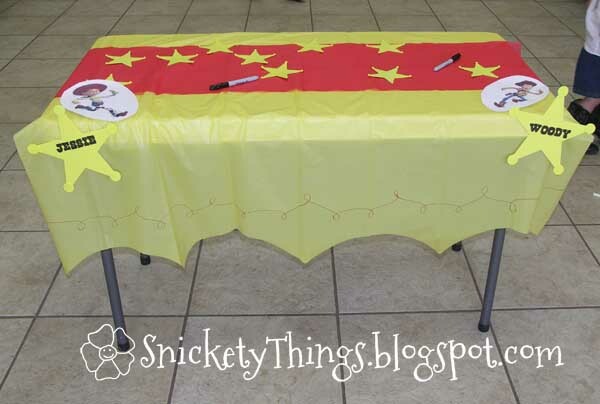 I cut the yellow tablecloth the same way and ran the red strip down the middle. I used clear red serving dishes that I bought at Target on clearance after Christmas (the party was in May so I was really planning ahead). I gave the kids pink and yellow lemonade to drink. The front tray has marshmallows dipped in chocolate with small bandanna flags and the other is a veggie tray. The bowls contain chips. At the other end of the table was the cake. I wanted the cake to really stand out on the table so I cut a square of blue to make the cake look special. 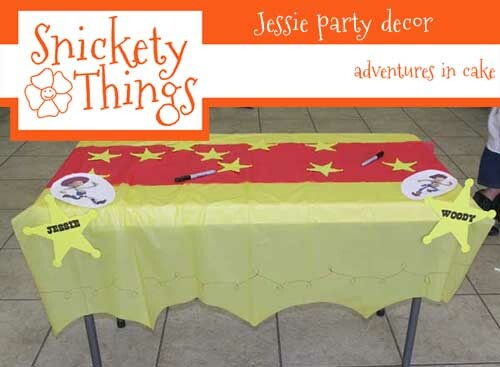 The seating area for the kids to enjoy their food was set to look like Jessie's pants. I started with a blue tablecloth and I cut a cow print tablecloth to run a strip down the middle. 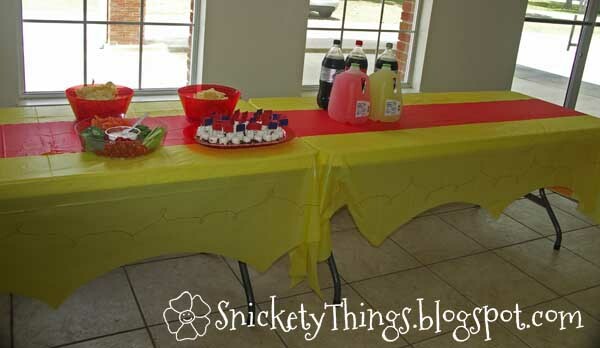 I used yellow plates and red cups and napkins. The table is sprinkled with small dollar store toys to keep with the Toy Story theme. The kids were allowed to take the toys home as part of their goodie bag. What do you think of the decor? In a future post I will tell you about the activities the kids participated in during the party. What a fun idea for a party. And your cake looks so great. Thank you so much for linking up on Fabulous Friday at Faith, Trust, & Pixie Dust. Thanks! It was a lot easier to keep track of the kids with their name tags on.